We, my walking partner and I, march through Pike Place to return home. We have noticed that everyday between 2 and 4 in the afternoon, bags of produce would be available at some stalls in one dollar bins. Each bag contains an assortment of fruits, vegetables or greens. The produce is usually a day or two old, most of it looks good and edible. The assorted fruits photographed above are from yesterday’s catch. I bought them for one dollar and my walking buddy purchased a bag of spring salad mix. She prepared turkey wrap with salad for supper and me a fruit chaat for dessert. I found the plums ripe and juicy. Royal Gala apple firm and sweet. Ruby orange juice tartly-sweet. I added little bit chaat masala to the cut fruits and tossed them together. Fruit chaats are always popular and this juicy, sweet version is no exception. Colorful and satisfying, this delightful treat turned out to be the highlight of our meal experience. 1 apple - peel, core and slice to bite-sized pieces. Take salt, black pepper and amchur in a mortar. With a pestle gently mix them together. This is chaat masala, my version. You could also add cumin to the mix. Take the fruits in a bowl. Pour over the ruby orange juice. Sprinkle the chaat masala. Add honey or sugar if you like. Toss. Spoon the chaat into cups. Enjoy. Makes two to four servings. Ruby orange has a barbaric sounding market name, but there is nothing barbaric in its taste. 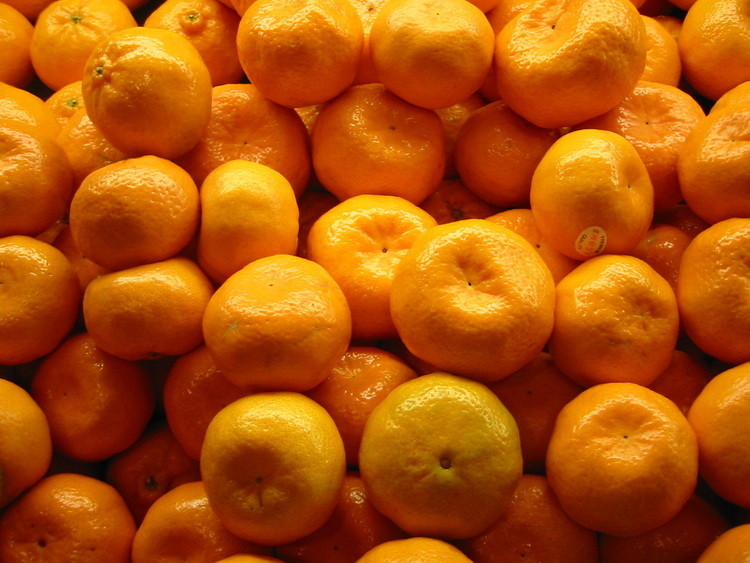 Sometimes oranges can be too tart, and tangerines can be too sweet. In ruby orange, the tart and the sweet come together to deliver a soul scintillating symphony. The rich maroon colored juice from this magnificent fruit commands cheers that would crescendo into a standing ovation with each sip. This is my first time with ruby oranges. Cut and squeeze. Just plain juice. Sugar was not added or needed. Served it chilled for a greater taste. And, what a delight! Ruby orange will be a regular from now on at my home. Before going in to weeklong JFI jaggery journey, I would like to know and I hope you all had nice time with your family and friends during Thanksgiving holiday weekend. For us, it was a working as well as relaxing weekend. I prepared some decent meals, read a funny book called ‘Food Moods’ and Vijay was working on his assignments and required readings. We mostly stayed home because of the weather here. It was raining and snowing. Yes, snow in Seattle. I didn’t expect that, but it also snows in Seattle. What a nice surprise. Cranberries, chestnuts, pecan pie and plum (fruit) cake - these are the things I look forward to during holiday season in US, every year. Their rich color, beauty and taste brighten up otherwise dreary cold days here. Cranberries in particular. Their bitter-tart taste is perfect antidote for too much fancy food that is common during this season. Last weekend among other things, I also prepared marmalade with cranberries. In addition to oranges and jaggery, I have added cloves on a whim and cloves fresh, refreshing aroma brightened up not only our breath but also our otherwise mundane morning jam-bread breakfast routine. Wash and remove bad cranberries. Peel orange and separate into segments over a bowl (to catch the juices). Powder the jaggery and measure. Make a fine powder of cloves. In a heavy pot, bring one cup of water to a boil. Add jaggery and wait until jaggery melts. Add cranberries and orange pieces. Cook, until the fruit breaks down, turn to mush and come together to a firm quivering mass. Takes about 15 to 20 minutes. Just before turning off the heat, sprinkle powdered cloves. Cook few more minutes and turn off the heat. Let marmalade cool completely. Store in a tight lidded, clean jar and refrigerate. Fills about 14 oz (400grams) jar. I’ve prepared mildly sweet marmalade. Adjust jaggery quantity to suit your taste. Recipe Source: My own creation. When I first made cranberry jam, I was pleasantly surprised at how good it turned out. One wintry day, on a whim, I cooked up cranberries with orange juice and added some jaggery - viola, a spectacularly delicious tartly, tangy and sweet jam in a beautiful shade of Burmese ruby. Tart cranberries and tangy oranges, in brilliant red and orange colors, dazzled me with promises of healthy glow and much needed Vitamin C. Who would think that, these two beautiful looking tarts taste that good when combined. Adding another tartly, sweet ingredient - jaggery, completed and complemented those two - making the end result, a tasty jam/preserve to enjoy. Native Indian and Indian ingredients for a western style breakfast of bread and jam - cost is low, recipe is easy, preparation time minimal. Give it a try, if you haven’t already. I usually make this jam, in small quantity for a week’s worth, but never in big batches like the seasoned jam makers do. So I’m not familiar with the sealing techniques for long-term storage etc., can’t offer any tips about that. My jam never lasted more than a week. Rinse the cranberries thoroughly. Pick out the bad ones, that are soft, shriveled or discolored. In a large pot, take orange juice and jaggery. Cook them until jaggery melts completely. When the juice starts to thicken, stir in the cranberries. Cook for about 15 to 20 minutes on medium heat, stirring in between. 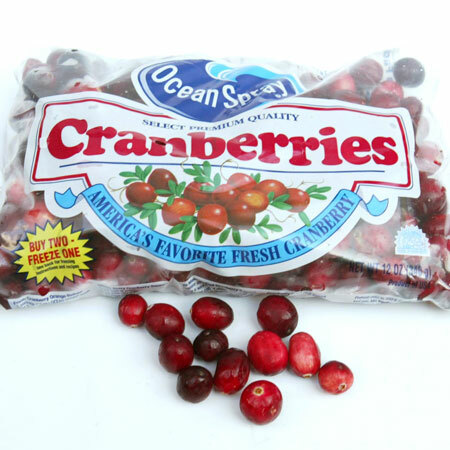 Cranberries first pop, then break down completely and turn into thick mush. Turn off the heat when it reaches jam like consistency, it further thickens on cooling. Store in a clean, dry jar.